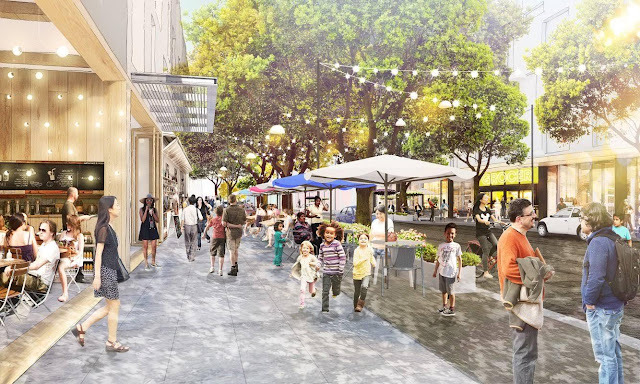 Two years ago, Facebook revealed that they were planning on building a kind of 'Facebook Town' near their headquarters in Menlo Park. At the time, the main reason given was that they wanted to create an ideal living space for their staff, complete with benefits like free food. There's been relatively little news on the matter since then, but over the weekend the building plans were officially announced on Facebook's official community page. The proposed 'Willow Campus' isn't quite the employee haven that was originally proposed. Rather, Facebook are framing it as a way of galvanising the local community, creating jobs, providing affordable housing, improving public transport and contributing to local economic growth. They're taking the old Menlo Science & Technology Park and using the 56-acre space to build a brand new community with 1,500 houses. As well as housing, Facebook plan to offer a grocery store, a pharmacy and "additional community-facing retail". There will also be office space and improved public transport services. Perhaps the most crucial factor of this plan, however, is that 15% of the housing will be offered at below-market rates. At a time when housing rates all over California, but especially in Palo Alto, are skyrocketing, this is a significant pledge. Facebook are filing the plans this month, and the actual construction of the town has been broken into four phases. The first phase, which will be more focused on housing, is estimated for completion in 2021, which suggests that the entire Willow Campus will be up and running by some time around 2027. Once people start moving in, the hope is that this will directly contribute to improved east-to-west transportation in and around San Fransisco. This is a canny move on Facebook's part. Creating what essentially amounts to a mining town for Facebook employees (as originally suggested) would have done little to ingratiate them to the local community. With Willow Campus, they're actually contributing to the local community and helping to drag it out of the infrastructural crisis that it's been languishing in for the last few years. Whether they'll carry on following through with similar plans after Willow Campus, or even if Willow Campus will actually be what they're touting it as, remains unclear, but since they're already submitting the plans for review, we'll have a better idea soon enough.